* Let us help you Make an Impression. 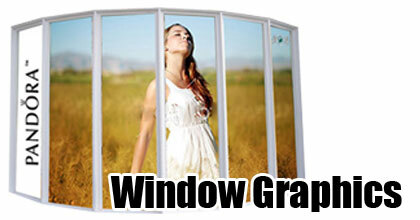 We offer full service solutions for your graphic needs in Lincoln Nebraska and the surrounding areas. We offer vehicle wrap design, vehicle wrap printing, and Avery Dennison Certified vehicle wrap installation. 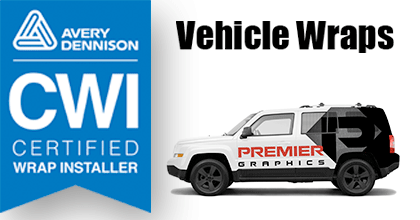 At Premier Graphics in Lincoln Nebraska, we can help you with full vehicle wraps, patial vehicle wraps, fleet graphics, and vehicle lettering. 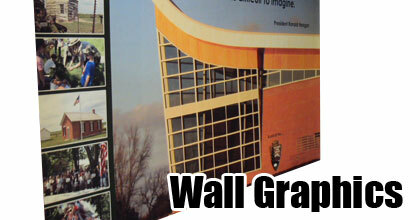 We also produce and install wall graphics, window graphics, custom decals, site signs, large and small banners, trade show displays, and much more. At Premier Graphics we are committed to providing you with a positive experience throughout the process of your project. We will be there to walk you through the necessary steps to ensure that you receive the highest quality product and that it fits the needs of your company or organization. We can work with you whether you have a large company, with a fleet of vehicles that you would like wrapped, or a small shop opening your doors for the first time. It is our job to help you stand out from the competition at any level. We will work hard to make sure your project is completed in a timely manner. During the course of your project we will maintain contact with you and keep you updated on its status. If you have a deadline, it will be met, period. We understand each business or person will have a different available project budget. We will ensure that you have the most effective finished product within your budget.